A historic necklace belonging to a prominent west coast mining family has returned to Queenstown for the first time in nearly a century. 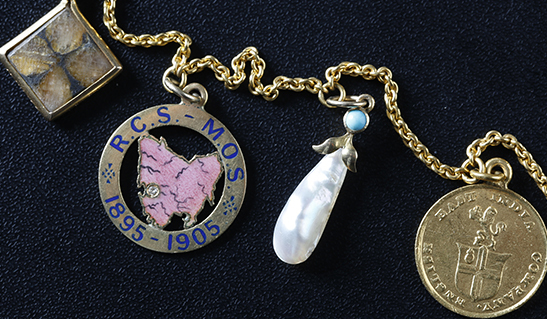 A gift from Robert Carl Sticht to his new wife Marion in 1895, the charm necklace tells the couple’s story, following their journey to Tasmania from the United States. Mr Sticht managed the Mount Lyell Mining and Railway Company in Queenstown from 1897 to 1921 after working there as a metallurgist for two years prior. 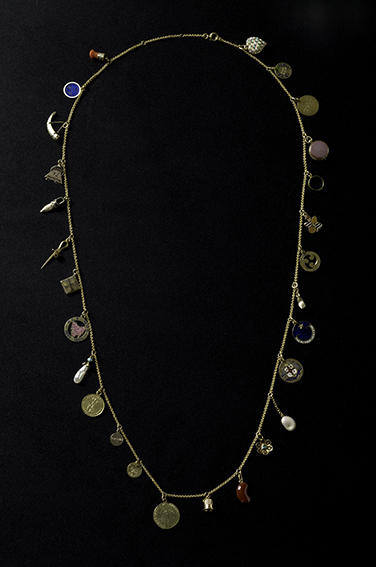 The necklace features 27 unique pendants, almost half of which are marked with significant dates and places relating to events in the family’s lives, including a map of Tasmania engraved with the couple’s initials and dates marking their tenth wedding anniversary. Some of the pendants have symbolic associations, including Robert Sticht’s fraternity pin from the Brooklyn Polytechnic, a baby’s tooth from their son Hadmar (b. 1905) and a miniature miner’s ‘spider’, a type of candle holder used inside a mine. Quite a few of the charms relate to luck, which might be expected of people involved in the mining industry. One of these is a stone specimen of chiastolite, a stone with a natural cross that was thought to protect from evil or bad luck. In 2018, the Tasmanian Museum and Art Gallery (TMAG) acquired the necklace for the State Collection, with the generous support of the TMAG Foundation – the museum’s main fundraising body. Since acquiring the piece, TMAG has worked with Libraries Tasmania, the West Coast Community Services Hub and local community members in order to return the necklace to Queenstown. 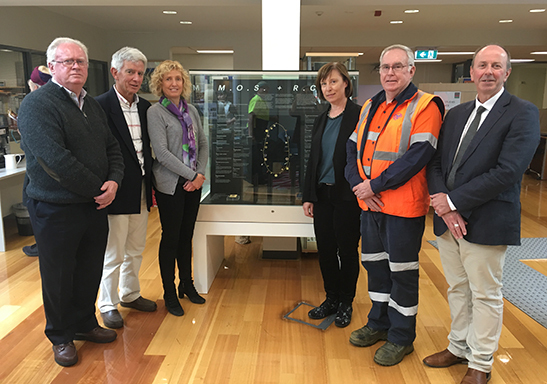 The necklace will be displayed at the West Coast Community Services Hubalongside other related items from TMAG’s collection throughout 2019, providing locals and visitors alike with the opportunity to connect with the rich history and stories of Tasmania’s west coast. This page was last modified on 27th March 2019.